For special occasions, parties, or any day fun, shop our shot glasses! 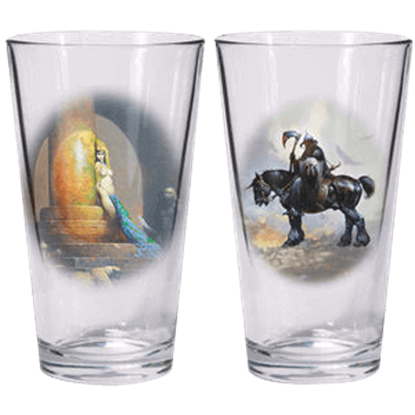 We have historical, fantasy, and gothic shot glass styles perfect for your next event or for adding to a collection. Check out gothic skull shot glasses and dragon shot glasses alongside pewter shot glasses fit for fine dining occasions. Grab a whole set of shot glasses and you will be ready to entertain in style at your next party. Mermaid shot glasses add a nautical touch, while our steampunk shot glasses are perfect for fans of science fiction and the Neo Victorian era. 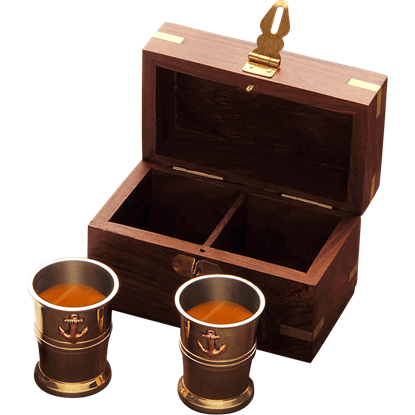 Swashbucklers will enjoy drinking from our pirate-themed shot glasses. No matter your taste or style, our medieval and fantasy shot glasses are perfect for lightening up the party or even displaying as part of themed drinkware collections. 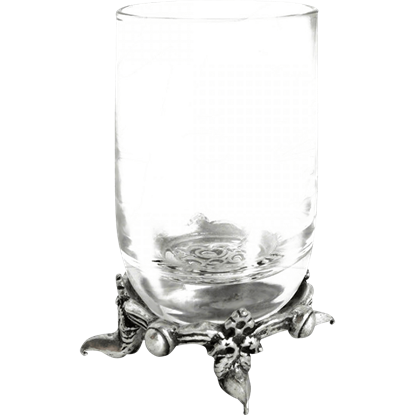 The Albrecht Durer Shot Glass is made from pewter and features a raised-relief decoration. This is a companion piece to our other Albrecht Durer items. A must have for any medieval enthusiast and also makes a great gift. A majestic stag runs through the forest, pursued by baying hounds. A hunter waits for the perfect moment to aim his rifle. 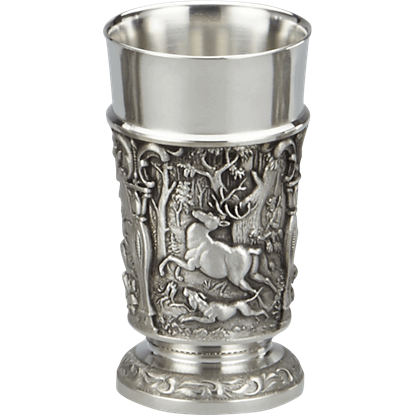 The Deer Hunt Shot Glass displays this woodland scene in high relief, with a polished rim and a pedestal base. 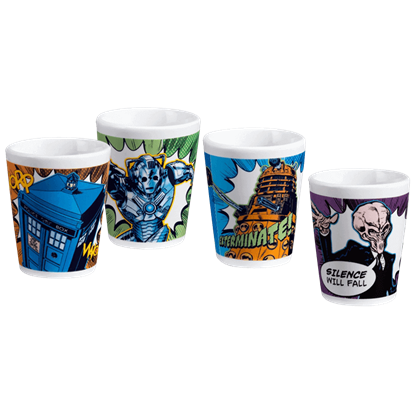 The perfect way to display your love for the classic show about a time-traveling alien and his iconic blue police box, the Doctor Who 4 Piece Shot Glass Set includes mini glasses showing various noteworthy characters and designs. Death is coming for us all, so we might as well greet him with a drink. 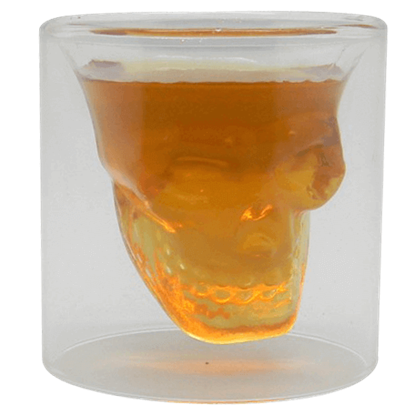 You can now have a drink in deaths honor with the intriguing Doomed Skull Shot Glass. 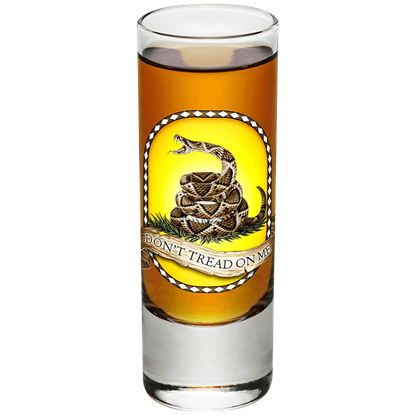 Impress those at the bar with this stylish and thrilling shot glass. 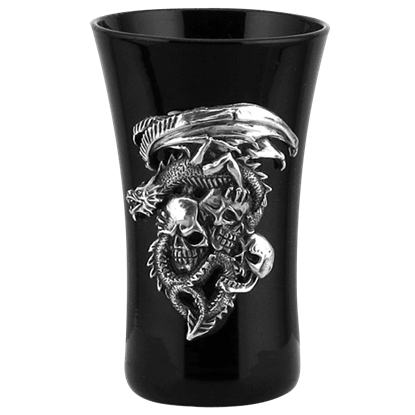 Impress your friends with this stylish Dragon and Skulls Shot Glass, which can add new dimensions to your kitchen. 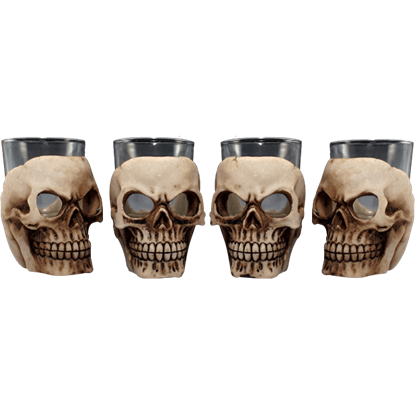 This item will grab everyones attention and have them all wanting their own shot glasses that have this much attitude. Nothing evokes grandeur quite like dragons. 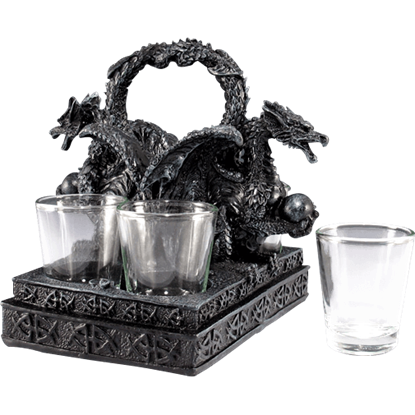 The Dragon Base Shot Glass Set is an impressive accent for entertaining guests as well as a statement piece for collecting and display. It is hand painted to look like ancient stone. 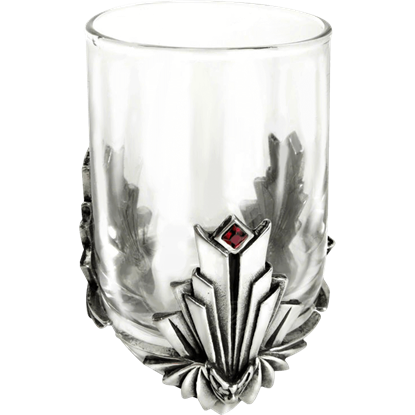 Dragon motifs decorate the flowered cross base of this luxury hard liquor glass. 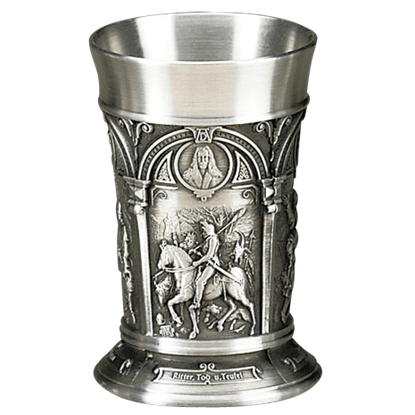 The Dragon Claw Shot Glass makes a stunning addition to your barware with its quality construction of glass and the finest English pewter.